Send encrypted emails without leaving Zola Suite and access court-admissible proof of delivery, time and email contents directly from its associated matter. 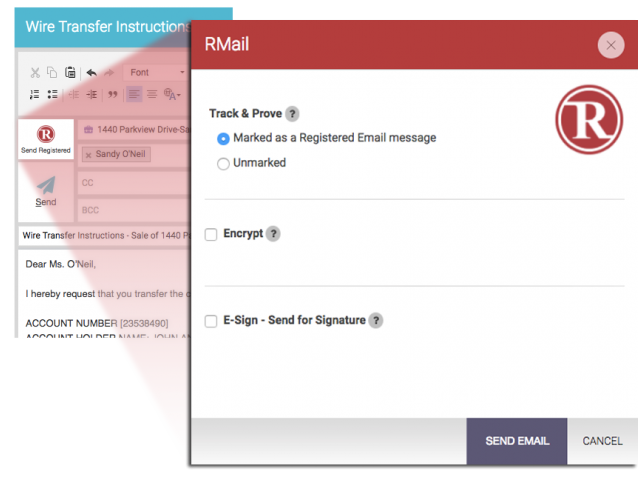 RMail empowers attorneys and other legal professionals, providing legal proof of delivery, the ability to send encrypted email privately, and the convenience of shifting important correspondence to email. RMail includes electronic signature capabilities, in order to obtain legally binding signatures on agreements, contracts and other documents, electronically. TRUST YOUR EMAIL WITH RMAIL . Have any questions? Want a Quote or Demo? Contact us!